Four months back I started working in a government home with 65 women and children. The home is divided into few rooms based on age and disability. Initially, I was permitted to work with elderly women who are abused and abandoned due to severe mental or terminal illness. Along with the illness, I found out that some women were from other states and did not speak languages I knew. A few women kept sleeping due to the effect of heavy medication and few others would just not respond or make an eye contact. Maybe this was the first time someone was coming to them and talking to them. I started searching for the jai shree krishna window but it was a struggle. I was reminded of a quote by Mother Teresa which says, “We cannot do big things but small things with great love” and I started with a small practice of just greeting them first as soon as I entered the premise. Some responded with the warmest smiles and some would just ignore my presence. Of course I felt awkward, I could see my ego crushing when I was treated as if I don’t exist, but I kept going. Meanwhile, I started spending time with children. We started sitting in circles, praying together, sharing stories on kindness, cleaning beds, doing artwork or talking about the planets. We sat in a common area where others could observe us. One day when I was cutting their tiny nails, one elderly woman came to me and showed me her nails. This was my first breakthrough. I took to the common room and started cutting her nails. They were hard, dirty and smelly. I was bombarded with thoughts such as: what if I hurt her unknowingly, she may hit me, spit or say something foul, what will I do then? what will the children and staff think of me? While listening to my inner blabbering I kept cutting nails. The nail cutting session ended, she looked up, smiled and told me that while I was cutting her nails she was reminded of her mother. I was touched!! and the doubts in my heart were replaced with a new energy. From that day nail cutter became my tool for building bridges. From that day, I would move around with my nail cutter and then the women would just come, not talk but get their nails cut. One day, while on my regular nail cutting job, one woman who generally hallucinates asked me to sing a bhajan (Prayer). These were my little break through into their worlds and spaces. The children mostly stayed away from the rooms where the women stayed. When, I would cut their nails, chat or sing prayers, children would hang near the door but would not enter the room. They would tease them with names and treat them differently. They would also tell me not to enter as I might catch the same disease. I asked the children how did they know if this was true? They said this is what they have heard from the staff and other girls. Children mirror what they see and not what we tell them and so I kept my routine of greeting them, cutting their nails and spending time going. Gradually children started to accompany me. Initially, they sat and observed and then slowly started interacting with the women. And, later I started conducting activities with children in the same room where the women could see us. Slowly the women also started to participate. 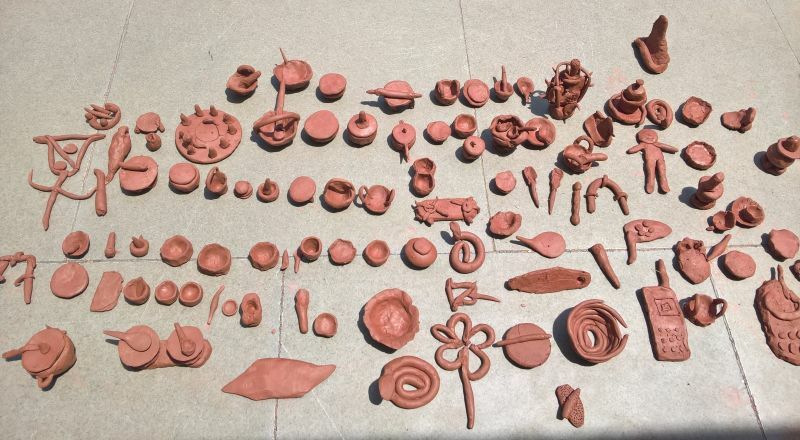 Yesterday children and women did clay work together. Two women, whom I thought were mute, spoke a few words with me for the first time. The children have stopped labeling and teasing them. They now hold hands which they initially feared. They now make space for them and share paints while doing art. One of the kids whose mother has abandoned her was sitting in the lap of an elderly woman suffering from a mental illness. When I first saw, I was a little concerned. Then, I asked the child, what was she doing there, she said, “I was just spending time with her, I often do that”. They hardly exchanged words but I could see love hanging between those unspoken words. A lady came to me and started speaking in Tamil. I did not understand a word but I kept listening. She came closer and I was on my guard. While my mind was preparing for the worst, she took my palms and rubbed over her cheeks and smiled wide. Wow!!! Very heart-opening and inspiring to read. Thank you so much! This is incredibly inspiring Trupti!! The visuals are so vivid and real! Deeply grateful for continuing to follow your inner voice :) I'm inspired!!! Trupthi Thank you so much for sharing this bit. God bless. What a wonderful write-up. It's as touching as the experience you shared.